Existing Wankel Rotary Engines available on the market typically use either closed-loop, oil-cooled or forced-air-cooled systems. AIE’s innovative SPARCS cooling system combines simplicity of design with the inherent high power-to-weight advantage of rotary engines, while practically eliminating the drawbacks these systems had in the past. 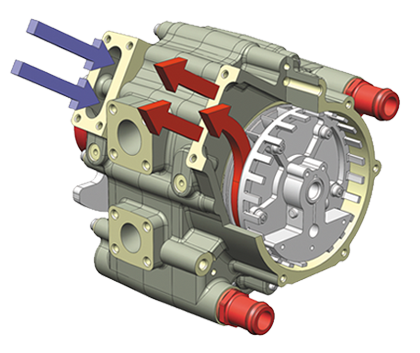 The SPARCS cooling system for Wankel Rotary Engines utilises the self-pressurising blow by gases from the combustion process (which have escaped into the interior of the engine’s core via the rotor’s side seals) as a cooling medium. This pressurised air-gas mixture is recirculated in a completely closed loop circuit by an internal fan which is driven by the main shaft. As it recirculates, the air-gas mixture passes through the engine’s rotor where it picks up heat before then being ducted through an external heat exchanger to reject the heat. The key to the system is that the high density of the pressurised air-gas mixture enables higher levels of heat removal from the engine’s rotor than through standard air cooling methods.As the SPARCS system is completely sealed, the oil loss to atmosphere typical of air cooled rotary engines is completely eliminated. Oil supplied to the engine core is continually recirculated in the cooling gas mixture lubricating all moving surfaces, until eventually migrating past the seal pack (providing lubrication) before being burnt in the combustion process. As the lubrication oil in the engine core is recirculated many times, overall oil consumption is significantly reduced. Intuitive SPARCS cooling features allow for superior heat rejection by utilising high density self-pressurising blow-by gases to absorb higher levels of heat from the engine core and dispersing that heat by means of an external heat exchanger.Outperforming standard rotary engine cooling methods, SPARCS technology works to preserve engine tips, seals and components to deliver amazing performance and reliability for a reassuringly long rotary engine life. Excessive oil consumption for rotary engines is now a distant memory with ingenious solutions from AIE patented SPARCS technology.SPARCS resourceful design repeatedly recirculates oil for complete lubrication of parts over a longer period of time before the oil is consumed in the combustion unit. This low oil consumption process is performed within a completely sealed engine core that eliminates external oil loss entirely, combining the advantages of existing oil and air cooled rotary engines for a sustainable option in cost, maintenance and for the environment. The benefits of the SPARCS cooling system isn’t only in its highly effective core engine heat rejection but also in its ability to rapidly warm and lubricate cold engine areas to deliver consistent and even overall thermal balancing.The thermal stability provided by SPARCS technology vastly increases engine efficiency by reducing stresses on internal seals and allowing the rotary engine to quickly reach optimal operating temperatures for maximum performance and long endurance.